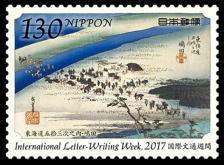 Japanese Stamp Specialized Catalog (JSCA) & SAKURA Catalog numbers are adopted. 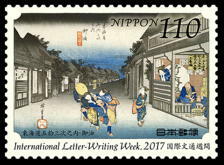 International Letter-Writing Week issue is an annual series since 1958, with the aim of contributing to the world peace by encouraging cultural exchange amongst people of the world through letter writing. 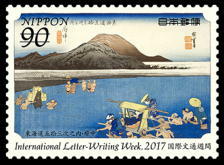 This year's stamps depict three posting stations that have never been selected for stamp design from "The Fifty-Three Stations of the Tokaido" and one more painting by Utagawa Hiroshige.